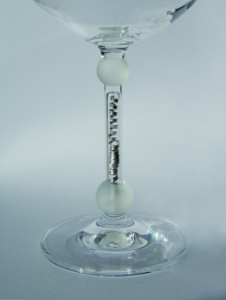 When the stem of the wine glass attracts more attention than the wine at the next wine-tasting session, it could be down to the glasses of ideco: Namely, products or product components such as small cogs or product-specific materials such as wood or metal can be “sealed” inside the stem of the hand-blown glasses. The jury of the Promotional Gift Award 2017 also cast a deep glance into the bottom of the glass or rather its stem and were convinced by the innovative individualisation idea: The result was a distinction in the category Customising Technologies. The wine glasses are manufactured in Germany using the latest emissions filter and more energy-efficient kilns and can at the same time be branded using all other possible glass embellishment methods such as imprinting, painting, engraving and polishing. The communicative goblets are especially suitable for companies from the construction industry, which can present their products – i.e. coloured cements, gypsum, pigments or glass – directly inside the stem.